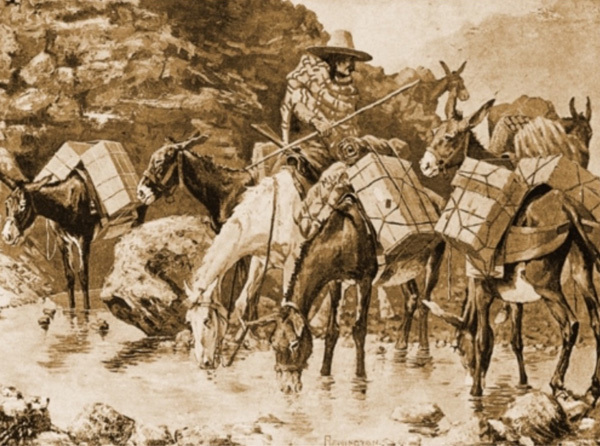 Mule Train Crossing the Sierras 1888 by Frederic Remington. These profiles are stories of individuals who have traveled the Old Spanish Trail for centuries as written and submitted by members of the OSTA Descendants & Travelers of the Trail Chapter. The purpose of these profiles is to bring the Trail to life by sharing our ancestors’ and other travelers’ histories in our own words. The mission of our chapter is to honor the contribution of the travelers of the Old Spanish Trail, find connections with others and preserve our history. In addition to historical profiles, we encourage modern explorers of the Trail to share their experiences. We hope that our stories will inspire you to write your own profile. Are you descended from someone who traveled the Trail? Have you researched someone who has sparked your interest? Have you traveled any or all parts of the Trail yourself? What’s the story you would like to share in your own words? If you are a member of the Old Spanish Trail Association, we invite you to join our Descendants & Travelers of the Trail Chapter. We are an internet-based group with members stretching from Cumbria, England, through the United States, to Brisbane, Australia, all united in a love of the history of the Trail. Please also visit us on our public Facebook page: Descendants and Travelers of the Old Spanish Trail Chapter. We hope to hear from you. Please contact ancestortraveler@gmail.com to find out how to submit your story or to request more information on joining our chapter.